John Bolton is President Donald Trump’s third national security adviser. Prior to his appointment, he was a senior fellow at the neoconservative American Enterprise Institute and the chairman of the Islamophobic Gatestone Institute. An extreme national security hawk, Bolton is a former board member of the Project for the New American Century and a past adviser to the Jewish Institute for National Security Affairs. He was a frequent contributor to Fox News, the Wall Street Journal, the Washington Times, the Weekly Standard, and other right-wing media outlets. Bolton has been a key Republican Party figure since he was tapped to serve in the Reagan administration in the 1980s, where he held a series of posts at USAID before joining a team of Federalist Society lawyers under Attorney General Edwin Meese. He later worked in several high-level positions in the George W. Bush administration, including as the State Department’s chief diplomat on arms control and as the U.S. ambassador to the United Nations. A major focus of his work in and out of government has been to free U.S. military power from international constraint. When Bolton was appointed national security adviser in March 2018, its prompted alarm across a broad spectrum of the political universe. Bolton was one of the primary actors in perpetrating the myth that Iraq, in 2003, was amassing weapons of mass destruction, and he remains unapologetic about bringing about a war that had enormous consequences for Iraq, the United States, and the entire Middle East. Bolton’s appointment coincided with a scandal involving his super PAC working with Cambridge Analytica, a research firm accused of using tens of millions of people’s data without their permission to craft targeted political campaign ads. During the 2016 election campaign, Bolton broke with neoconservative pundits like Robert Kagan and Bill Kristol in praising Donald Trump‘s foreign policy positions. He commended Trump for saying that Islamic militants are waging an “ideological war” on the West, for calling the planned withdrawal of troops from Iraq “reckless,” and for urging more military action against ISIS. Bolton used his frequent appearances on Fox News to promote his policy ideas, bringing them to the attention of frequent Fox viewer, Trump. He expressly called for regime change in Iran, for example. He also expressed other radical ideas, such as resolving the Israel-Palestine conflict by having Jordan annex the West Bank, something the kingdom has made clear it would never do. Several top National Security Agency officials resigned, some under pressure, shortly after Bolton assumed his post. In May 2018, Bolton brought in one of his long-time compatriots and an extreme Islamophobe, Frederick Fleitz, as his chief of staff. Pressing an attack on Iran was immediately at the forefront of Bolton’s agenda when was named Trump’s national security adviser. He had an ally in this effort in Secretary of State Mike Pompeo, and the president frequently portrayed Iran as a grave threat to the United States. But Trump had also campaigned on criticism of U.S. involvement in long term wars in the Middle East. The result of these contradictory positions was that Trump was apparently open to the idea of an attack on Iran in some form, but the case would have to overcome some level resistance. In early 2019, it was revealed that Bolton had recently requested that the Pentagon draw up plans for an attack on Iran. The request came just after an Iraqi militant group known to be sympathetic to Iran had launched mortars in the vicinity of the U.S. embassy in Baghdad, followed two days later by another group firing a missile close to the U.S. consulate in Basra during anti-Iran protests where the Iranian consulate was set ablaze. No one was harmed and there was no evidence to connect Iran directly with either attack—or even any certainty that the U.S. installations were the intended targets—but Bolton requested the attack plans, perhaps seeing an opportunity to use these incidents as a pretext to escalate tensions with Iran. The Wall Street Journal reported, “The request, which hasn’t been previously reported, generated concern at the Pentagon and State Department, current and former U.S. officials say. It was not clear whether Bolton ever reported on this to Trump, the president even knew about these plans, or whether more serious planning for a strike on Iran took place at that time. As 2018 drew to a close, Bolton found himself in a tug of war within the Trump administration over the U.S. presence in Syria. In mid-December and seemingly unprompted, Trump announced that he was pulling U.S. troops out of Syria. The withdrawal of some 2,000 soldiers was apparently decided on without consultation with U.S. allies or with any of the president’s advisers. The fallout was considerable. Secretary of Defense Jim Mattis resigned almost immediately in protest, and both traditional hawks and neoconservatives were extremely critical of Trump’s decision. Turkey was Bolton’s next destination after Israel, and President Recip Tayyip Erdogan did not respond kindly to Bolton’s statement. Calling Bolton’s words a “grave mistake,” Erdogan stated, “It is not possible for us to swallow the message Bolton gave from Israel.” Erdogan refused to meet with Bolton, a strong message to him and the Trump administration. In January 2019, despite Bolton’s claims that troops would not leave until the conditions were “right,” the U.S. started pulling its troops out of Syria. Bolton was widely seen as the driving force behind Trump’s decision to pull the United States out of the Intermediate-Range Nuclear Forces (INF) Treaty. This treaty—signed by President Ronald Reagan and Soviet Union Premier Mikhail Gorbachev—eliminated US and Russian land-based short- and medium-range missiles, both nuclear and conventional. It was a key staple of the non-proliferation regime. Cirincione noted that there was a legitimate basis for accusing Russia of violating the INF, but that this was not nearly enough reason to withdraw from a treaty that was, on the whole, still achieving its purpose. Instead, Cirincione contended, the decision to withdraw was based on a desire for new missiles called for in Trump’s Nuclear Posture Review, issued early in 2018. Bolton’s appointment ensured that Trump would stay the course in abandoning the Iran nuclear deal, and he did. His support for military action against Iran is well known, and he has held that position for many years. In 2015, he penned an op-ed in the New York Times entitled, “To Stop Iran’s Bomb, Bomb Iran.” In it, he made clear that he envisioned not only a military attack, preferably by Israel, on Iran’s nuclear infrastructure, but also a U.S.-engineered regime change in Iran. Bolton sent shock waves through the U.S.-North Korea talks when he raised the spectre of Libya in the context of Korean de-nuclearization. The mention of Libya—whose former leader, Muammar Qaddafi, had agreed to give up its fledgling nuclear weapons program and, some years later, saw the United States help oust him from power and eventually to his death—undermined whatever faith there might have been in the Trump administration working with North Korean leader Kim Jung Un rather than trying to push him out. Bolton further stated that these same protections would be extended to cover Israel as well. At another point in the speech, Bolton also announced that the United States would be closing the office of the Palestine Liberation Organization in Washington. The speech took place just as the ICC was considering investigations of both Israeli activities in the Palestinian Territories and of U.S. actions in Afghanistan for potential war crimes. Whiting pointed out that, while there is no obvious legal mechanism for the U.S. to follow through on this threat, “such language demonstrates a willingness by this administration—which has shown a remarkable disregard in the past for law, institutions, and norms—to go very far in its efforts to break the court.” He also noted that the administration’s attitude will have a chilling effect on support for the ICC around the world. “The new rhetorical framing and policy positions genuinely risk serious damage to the ICC and the rule of law around the world, and these steps will be difficult, if not impossible, to undo. The court, for instance, may no longer be recognizable by the time a new U.S. administration makes the effort to pick up the pieces,” wrote Whiting. Bolton told the Heritage audience, “Under our new Africa strategy, we will target U.S. funding toward key countries and particular strategic objectives. All U.S. aid on the continent will advance U.S. interests, and help African nations move toward self-reliance.” Those objectives would include countering both Chinese and Russian influence in Africa, fighting militant groups such as ISIS and al-Qaeda, and “ensuring that all U.S. assistance dollars sent to Africa are used efficiently and effectively to advance peace, stability, independence, and prosperity in the region.” Bolton suggested that the U.S. would pursue these goals through a combination of investment and guidance, with few details on just what these broad tactical outlines would entail. In March 2018, just after Bolton’s appointment as national security adviser was announced, the connection between the John Bolton Super PAC and Cambridge Analytica – a corporation that was under fire for mining the personal data of tens of millions of Facebook users without permission to target them for political campaigns – came to light. In the election cycles of 2014 and 2016, Bolton’s super PAC paid Cambridge Analytica approximately $1.1 million for research. In another NPF memo, two NPF employees told Bolton that, in return for a $200,000 donation by U.S. West, the telecommunications company should be assured its top policy issues would be incorporated into the agenda for NPF’s upcoming telecommunications “megaconference.” Bolton left his position at the NPF shortly before Congress launched its probe into whether the group illegally accepted foreign contributions. No charges were ever filed because of the congressional hearings. Quoted by Kamal Ahmed and Ed Vulliamy, “Hawks sit out phoney peace while war machine rolls on,” The Guardian, January 12, 2003,http://www.theguardian.com/world/2003/jan/12/iraq1. John Bolton, “U.S. Isn’t Legally Obligated to Pay the UN,” AEI, November 17, 1997,https://web.archive.org/web/20090514113121/http://www.aei.org/issue/17649. 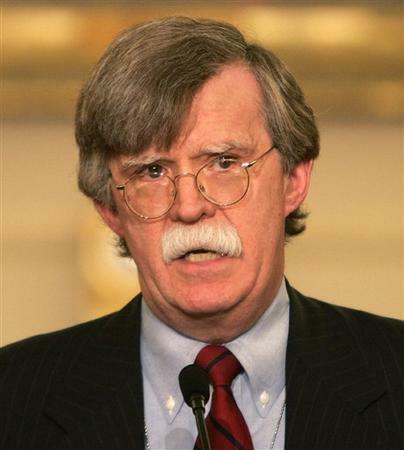 PR Newswire, “Ambassador John Bolton Launches The Foundation For American Security & Freedom,” February 19, 2015,http://www.prnewswire.com/news-releases/ambassador-john-bolton-launches-the-foundation-for-american-security–freedom-300038477.html. Michael Patrick Leahy, “John Bolton Super PAC to Spend $5 Million Online in Key Senate Races,” Breitbart, September 20, 2014,http://www.breitbart.com/Big-Government/2014/09/20/John-Bolton-Super-PAC-to-Spend-5-Million-Online-in-Key-Senate-Races. Eric Lipton, “G.O.P.’s Israel Support Deepens as Political Contributions Shift,” The New York Times, April 4, 2015,http://www.nytimes.com/2015/04/05/us/politics/gops-israel-support-deepens-as-political-contributions-shift.html. The Washington Post, “Foundation for American Security and Freedom: ‘The One’ | Campaign 2016,” August 6, 2015,http://www.washingtonpost.com/posttv/politics/foundation-for-american-security-and-freedom-the-one–campaign-2016/2015/08/06/39b62e92-3c72-11e5-a312-1a6452ac77d2_video.html. Robert Costa, “Bolton Plans a Tour of Early-Primary States,” National Review Online “The Corner” blog, June 24, 2013,http://www.nationalreview.com/corner/351921/bolton-plans-tour-early-primary-states-robert-costa. Quoted in John Kleefield, “John Bolton For President?” Talking Points Memo, September 2, 2010,http://tpmdc.talkingpointsmemo.com/2010/09/john-bolton-for-president-video.php. Quoted in Media Matters, “Right-Wing Media Point Fingers At Obama For Libya, Egypt Attacks,” September 13, 2012,http://mediamatters.org/research/2012/09/13/right-wing-media-point-fingers-at-obama-for-lib/189885. John Bolton, “How Rouhani Is Playing Obama,” Wall Street Journal, September 29, 2013,http://online.wsj.com/news/articles/SB10001424052702304213904579095771799293040. John Bolton, “We cannot verify and must not trust Iran’s promises on nuclear weapons,” Guardian, October 15, 2013,http://www.theguardian.com/commentisfree/2013/oct/15/cannot-verify-trust-iran-nuclear-weapons. John Bolton, “Obama’s back-footed response to Putin’s embrace of Syria,” National Review, October 18, 2015,http://www.washingtontimes.com/news/2015/oct/18/john-bolton-russias-syria-campaign-blurs-obamas-vi/. John Bolton, “John Bolton: To Defeat ISIS, Create a Sunni State,” The New York Times, November 24, 2015,http://www.nytimes.com/2015/11/25/opinion/john-bolton-to-defeat-isis-create-a-sunni-state.html. Fox News, “Bolton: Obama WH Has Had the Most Hostile Relationship With Israel Than Any American Presidency,” April 29, 2014,http://www.realclearpolitics.com/video/2014/04/29/bolton_obama_wh_has_had_the_most_hostile_relationship_with_israel_than_any_american_presidency.html. John Bolton, “A ‘three-state solution’ for Middle East peace,” Washington Times, April 16, 2014,http://www.washingtontimes.com/news/2014/apr/16/bolton-a-three-state-solution-for-middle-east-peac/. John Bolton, “Overthrowing Saddam Hussein was the right move for the US and its allies,” The Guardian, February 26, 2013,http://www.guardian.co.uk/commentisfree/2013/feb/26/iraq-war-was-justified?commentpage=1. John Bolton, “Paris attacks: Four important lessons world must learn from French tragedy,” Fox News, November 14, 2015,http://www.foxnews.com/opinion/2015/11/14/paris-attacks-important-lessons-must-heed-from-french-tragedy.html. Sandy Fitzgerald, “John Bolton: Beijing, Moscow Will ‘Take Advantage’ of Obama’s Weakness,” Newsmax, October 27, 2015,http://www.newsmax.com/Newsfront/john-bolton-barack-obama-weakness-china/2015/10/27/id/699237/. Ian Williams, “John Bolton in Jerusalem: The New Age of Disarmament Wars,” Foreign Policy In Focus, February 20, 2003,http://www.dissidentvoice.org/Articles2/Williams_DisarmamentWars.htm. Walter Pincus, “Taiwan Paid State Nominee For Papers on U.N. Reentry; Bolton’s Objectivity On China Is Questioned,”Washington Post, April 9, 2001. Associated Press, “North Korea Bans Bolton from Talks,” Washington Times, August 3, 2003,http://www.washingtontimes.com/news/2003/aug/4/20030804-121425-6611r/?page=all. Warren Hoge, “Praise at Home for Envoy, But Scorn at the UN,” New York Times, July 23, 2006,http://www.nytimes.com/2006/07/23/world/23bolton.html?pagewanted=all&_r=0.